I just got back from the first sessions of the Stars tryout camp, so I want to get as much typed up as I can before I go to bed. I do not have access to a scanner, so I will not be able to scan the rosters and upload them to the blog. I thought about typing each of the players out, but that would take forever. Hopefully someone who was at the tryouts tonight can scan them, and send them to me. If not, I will try to scan them when I get back to Lincoln late Monday night. After initially looking at the rosters, the only Stars player that I didn't see from last season was forward Chris DelMauro. I heard from a couple of folks tonight that DelMauro has decided to quit hockey and stay home in New Jersey. 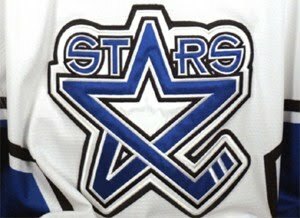 Returning Stars players at camp are: Josh Berge, Garrett Peterson, Dominik Shine, Ryan Dzingel, Tyler Deresky, Sam Alfieri, and Frank Misuraca. John McCarron was not in attendance tonight, but I heard that he had to miss the first day due to a graduation function, so he should be in attendance the next three days. Brent Tate was in attendance, but he was in street clothes. I heard he is recovering from surgery. Three out of the six players chosen in the Stars futures draft were in attendance, which included Luke Johnson, Bradley Hawkinson, and Cole Martin. Missing were Zach Frye, Max Coatta, and Dylan Blujus. Of the 17 players picked by the Stars in the entry draft, only three were not in attendance (Mark MacMillan, Joshua Thorimbert, and Michael McKee). Only 7 goaltenders were invited to the Stars tryout camp this year, down from 10 goaltenders last year. I was very happy to see a majority of players drafted by the Stars in the recent USHL Futures and Entry drafts on the tryout roster. Defenseman Richard Coyne and forward Andrew Schmit, who were acquired from the Chicago Steel by Lincoln, were also in attendance. First up Sunday night was a team practice for the Blue squad. This was held from 6pm until 6:45pm. It was a VERY up-tempo practice session with head coach Chad Johnson instructing from the ice. Associate head coach Jimmy McGroarty and assistant coach Nick Fouts also were on the ice during the practice session. Although it was just a practice, the players that stood out to me were Jake Lynes (F), Ian McGilvrey (F), Steven Duda (D), Zack Smoot (F), and Jeff McMinimy (F). Goaltender Kevin Murdock participated in the practice also. It was great to see Doc back on the ice. The first scrimmage Sunday night was held at 7pm between the Grey squad and the Red squad. Grey won the scrimmage, 5-1. Scoring goals for Grey were Taylor Fraser (F), Josh Berge (F), Joshua Roberts (F), Nick Cruice (F), and Tony Koehler (D). Tony Koehler is the younger brother of former Stars forward JJ Koehler. Scoring the lone goal for the Red team was Garrett Peterson. Players on the Grey team that stood out to me were Michal Imrich (D), Eric Sheid (F), Michael Sardella (F), Josh Berge (F), Taylor Fraser (F), and Nick Cruice (F). Players on the Red team that stood out to me were Garrett Peterson (F), Richard Coyne (D), and Tyler Deresky (F). Red goaltender Peter Traber played the whole game for his team, and surrendered all five goals. Grey goaltender Jim Kruger played the first half of the scrimmage and gave up 0 goals. Blue goaltender Luke Haffner played the second half of the game and gave up one goal. There was one fight in this scrimmage between Grey forward Cory Sellers and Red forward Richard Young. Richard Young played last season for the Youngstown Phantoms, and is a good sized kid who is not afraid to drop the mitts. In this tilt, Young seemed to slip as Sellers threw a punch and this fight ended very quick. My MVP of this scrimmage was Grey forward Michael Sardella. Sardella is a big kid (6'4", 218 pounds) who showed very good speed and quickness for his size. The second scrimmage Sunday night was held at 8:40pm between the Black squad and the Yellow squad. The Black team won this game in overtime, 3-2. Scoring goals for the Black squad was Andrew Schmit (F), Dominik Shine (F), and Ryan Dzingel (F). Dzingel scored the winning goal in the OT period on a very nice individual effort. Scoring goals for the Yellow squad was Matt Johnson (F), and Travis Maxwell (F). Players on the Black squad that stood out were Dominik Shine (F), Andrew Schmit (F), Lawrence Childs (F), and Bryan Fiol (F). Players on the Yellow team that stood out were Chris Casto (D), Sam Alfieri (F), Will Suter (F), and Matt Johnson (F). This scrimmage had a much quicker pace than the earlier scrimmage, in my opinion. I was told that the coaches weren't too happy with the pace of the first scrimmage, so they let the players know before this scrimmage that they had better pick up the pace. Red goaltender Jonas Langmann played in net for the Yellow team in this scrimmage, and gave up three goals. Black goaltender Trevor Gutierrez gave up two late goals to allow the Yellow squad to tie the game late in the last period. Team Black had a 2-0 lead for most of this scrimmage until the Yellow squad stormed back to score two quick goals in the final minute. There was one fight in this scrimmage between Yellow forward Kyle Lapenski and Black forward Andrew Schmit. This was a heck of a scrap, with Schmit getting the decision. My MVP of this scrimmage was Black forward Andrew Schmit. Schmit is another big kid (6'4", 220 pounds) who showed soft hands around the net, and was very physical along the boards. Well, that's it for the first day. There was a very good turnout of Stars fans Sunday night, which was great to see. I will be in attendance all day Monday, so I hope to post an update during the break in the afternoon. Stay tuned for that. If you were at tryouts Sunday night, I'd like to hear from you! Please leave a comment, and tell us which players impressed you. Thanks. The goaltender for the yellow squad last night was Jonas Langmann from Germany. He showed some nerves early but settled in and made some nice saves. The big standouts to me were Berge in the first game (the kid just finished rehab and got on the ice a week ago) and Dzingle in the second game. Thought the defensemen in the second game were really good on both sides. Thanks for the post Yeti!! Great for you to keep us informed! Not sure if I'll make it up there this year. Cant wait for stars hockey! I am currently working on a write-up for the Monday morning session, so stay tuned for that. Lots of good action already this morning. I've been pretty impressed with the level of hockey being played so far.